To read this newsletter in its .pdf form, click here to download the file: May 2010 Newsletter. Thank you. As a sequel to last month’s newsletter on inflammation, let’s look now at one of the key factors that creates inflammation—the recent shift in the quality and quantity of fats and oils we consume. Our per capital consumption of commercial, denatured pro-inflammatory salad and cooking oils has soared, from 2 pounds in 1909 to some 54 pounds today. These manipulated vegetable oils alone explain virtually all (98 percent) of the century-long, three-fold increase in our per capital consumption of total fats and oils from all sources. This is all the more remarkable in a culture leery of fats. Our relatively recent shift from traditional to denatured fats is just one factor that our body must contend with. The change in our modern diet toward more and more processed, convenience foods creates a tremendous genetic “load” to the human system, as we consume more refined sugar and white flour, high fructose corn syrup (HFCS), genetically-modified foods (GMOs), artificial sweeteners and other artificial foods and ingredients. You may recall the chart below illustrating sugar consumption from April 2009. A graph of the consumption of inflammatory vegetable oils, if drawn on a similar time scale would look remarkably similar. Within the long evolution of man as we know him—some 42,000 years walking the earth—our shift in just the last century to refined sugar, HFCS, GMOs, and denatured oils is without precedent. We have to wonder what these dramatic changes do to our genetic makeup. Modern commercial “light” vegetables oils are stripped of their antioxidants so they fuel free-radical damage and inflammation, while also disrupting metabolism. They are hard to avoid if we eat prepared foods since food manufacturers rely on these due to their lower cost and long shelf life. The time we spend in shopping for whole foods and preparing them at home just may save us—through better health and more productive years—in the end. Are vital to give the body the right materials to build healthy cell membranes, which are made of fats. Cell membranes need to be “smart” to monitor traffic in and out of the cell, just as the lining of the digestive tract screens and prevents toxic materials from entering the blood stream. Traditional fats, both saturated fats like butter from grass-fed cows, and omega-6 to omega-3 oils3 in a healthy balance of roughly 3:1 are important for proper cell function. Saturated fats provide rigidity and structure for cell membranes, while omegas offer both flexibility and the building blocks for high-order, sophisticated electrical/neurological function. Humans have survived through the millennia consuming traditional fats: Scientific research suggests that man as we know him today may have started around 40,000 BC to walk, forage, and munch about the earth. So, our genetic heritage has been grounded and programmed for some 42,000 years by natural foods. Our forebears survived quite well both on plant-based, nutrient-dense whole foods rich in antioxidants, phytonutrients and fiber and on protein and traditional kinds of fats obtained from wild game, grass-fed animals, fish, raw dairy products, nuts, and seeds. So, most traditional cultures consumed a healthy blend of saturated animal fats, as well as omega-3 and omega-6 essential fatty acids from plant-based foods and fish. It has only been in the last 50-60 years, through modern, manufactured foods, that we have incorporated into our diet a variety of manipulated, refined, and artificial foods as well as denatured, manipulated fats in the form of refined vegetable oils, trans fats, and grain-fed animal products. Just in the last century, per capita consumption of refined salad and cooking oils has increased 25-fold—from 2 pounds in 1909 to some 54 pounds today! But as obesity, inflammation, and chronic disease would suggest, manufactured foods have been wrenching to our natural genetic programming and makeup. The root of the word inflammation is “flame” or fire, and when I think of fire I think of friction and heat; of discord and dissonance. Refined sugar and flour, high fructose corn syrup (HFCS), genetically-modified foods (GMOs), artificial sweeteners and manipulated fats create dissonance and heat within our fragile system causing inflammation and chronic diseases. Genetic load are the words that come to mind as I think of the challenge posed to our body by modern fractured foods: They put us outside of any evolutionary process or norm, leaving us little margin to adapt to such sweeping change. For every pound of whole grains consumed, we eat 8 pounds of grains in their refined, fractured form. Refined grains spike blood sugar and contribute to inflammation. We consume 30 teaspoons of sugars and sweeteners a day (the equivalent of 10 feet of sugar cane! ), largely in the form of corn sweetener derivatives. HFCS has come from nowhere since the late 1960s to surpass sugar as the primary sweetener in the American diet. The average person consumes more than 80 pounds of metabolism-disrupting corn sweeteners each year. Sweeteners of all types, but particularly HFCS that is manipulated and derived from GMO corn, also feed inflammation. Soft drinks are the major way HFCS enters the daily American diet. Soft drinks deliver fast sugar calories, bypassing the body’s satiety messages. The typical American drinks 60 gallons of soft drinks (largely HFCS-based) a year, compared to 10 gallons (these were derived from refined sugars) in 1950. HFCS disrupts metabolism and spikes blood sugar more than refined sugars. But now, let’s move on to the heart of our story, to the relatively recent shift—dramatic by evolutionary standards—both in the quantity and quality of fats in our diet. Our daily consumption of refined vegetable oils is rarely noticed because these cheap oils with their long shelf life creep into our manufactured, processed commercial foods as hidden ingredients. I can think of three major reasons to explain the stunning increase in pro-inflammatory vegetable oil consumption over the last century—the influence of the food industry; our fear of the extra calories in fats compared to protein and carbohydrates as well as our fear of cholesterol in saturated animal fats; and our modern convenience lifestyle. All of these have driven both the shift away from traditional, health-supportive fats toward manufactured oils and the major increase (through convenience foods) of inflammatory oils that are hidden and invisible in our daily packaged/processed foods. Food companies in the years following World War II wanted to shift away from using traditional, fragile, expensive fats like butter and unrefined coconut oil as ingredients to cheaper, refined vegetable oils with a long shelf life. They convinced us that saturated fat and cholesterol were bad and the “lite” vegetable oils were a healthier choice. So, we began to purchase for our home cooking and baking needs these crystal clear vegetable oils for their long shelf life and for what we believed were their health benefits. What we were not told is that these commercial “light” vegetables oils are stripped of their antioxidants so they fuel free-radical damage and inflammation, while also disrupting metabolism. The calorie message about fats also resonated with us, as the no-fat/low-fat/unsaturated fat message fell upon on our receptive, weight-conscious ears. After all, we have been schooled to think of food foremost from the standpoint of calories: Ounce for ounce, fat has more than twice the calories of proteins and carbohydrates. Done! Finished! This seemed all that we needed to know. The modern convenience lifestyle brought with it more and more boxed, packaged, and processed foods (the broad expanse of the interior isles of the grocery store) and the spreading net of fast food restaurants throughout the country. Prepared foods are often hidden sources of denatured fats. Given the three-fold increase in our consumption of fats despite our cultural effort to avoid fat, we have to suspect convenience foods to be one of the key ways that these oils slip into our daily diet. How else could this happen? So, with our attention on convenience and our focus on saturated fats and calories, we took little time in recent decades to distinguish between the fats that support health and those that undermine it. While good fats play a vital role in health as enumerated above, unhealthy fats play a major role in inflammation and chronic diseases–cancer, diabetes, heart disease, arthritis and joint pain…all chronic pain issues, for that matter. 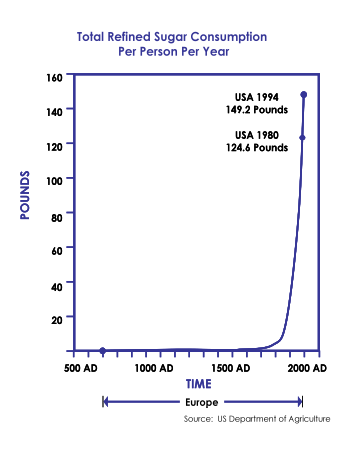 Despite our low-fat intentions, we actually consume about three times as much fat (85 pounds compared to 32 pounds) as a century ago (Chart 1, below). Virtually this entire increase (98% to be exact) is explained by refined, denatured vegetable oils (Chart 2, below). The typical American consumes 25 times more pro-inflammatory omega-6 refined vegetable oils than a century ago (Chart 2, below). These oils are largely corn, soy, and cottonseed that have been stripped of protective anti-oxidants and heated to high temperatures. As we gain weight using “light” vegetable oils that upset metabolism, Americans continue to shy away from butter, using only half of this stable, nutrient-dense, traditional fat relative to 1950 and a only a third compared to a century ago (Chart 3, below). Like manipulated vegetable oils, animal fats are equally transformed due to the shift away from green-grass pasture animal grazing to grain/antibiotic feeds and commercial lots. From the balanced 1:1 ratio of omega-3 to omega-6 fats of the traditional meat of grazing animals, modern animal fats are now heavily weighted toward omega-6 inflammatory fats. Consuming animal products per se may be less at issue than the pro-inflammatory character of our modern meat supply, since when we eat feedlot beef, we are consuming GMO corn and soy (Chart 4, below). The modern feedlot also relies on “economies and efficiencies” to make meat more affordable, so commercial meat is often viewed as an essential rather than an occasional luxury in the daily diet. Americans eat more meat and poultry today than ever before. The calorie energy from affordable meat and poultry often serves to “crowd out” from the diet nutrient-dense plant-based foods, which are rich in antioxidants, phytonutrients, and fiber. We all create mental models4 to help us understand our impressions and experiences. Mental models work as a scaffold, a framework, for us to interpret the past and predict the future. They help us explain reality. And, they help us decide, make choices and shape our actions. I grew up in the initial wave of the postwar baby boom and as a child enjoyed the period of prosperity in the 1950s and 1960s. It was the era of Jello, Kool-Aid, Cool Whip, Miracle Whip and other convenience foods. It was the beginning of television, of shopping malls, and of fast food chains spreading their nets across America. By the 1970s, I, like many women, spent long hours in a career, helped by time-saving convenience foods for calorie energy—and occasional antibiotics when needed to keep up the rapid pace. We never thought twice about our convenience foods. Calories Equaled Food, how simple! Calories = Food? Calorie Energy=Food? Modern evidence in terms of obesity and ill-health suggests that there is a backside to this mental model. Edible sources of calorie energy and whole foods are very separate concepts, indeed. Is our food: Whole or fractured? Real or artificial? Having life force energy and vitality or lifeless? We maintain our autonomy and our freedom of choice and we are empowered when we keep quality in mind and take time and care and pay attention when we select our food. Paradigm Shift: The Food—REAL Food—Matters Model. Whole foods have vitality—their own vital force energy—to restore our health and vitality and general sense of well-being. The importance of knowing where our food comes from means putting a new value on the time we spend shopping and cooking—or, if we do not like cooking, that we care enough to find reliable sources of prepared foods created by people who care about quality. It all begins with Awareness, Intention, and Planning, and ends with Enjoyment and Improved Health. 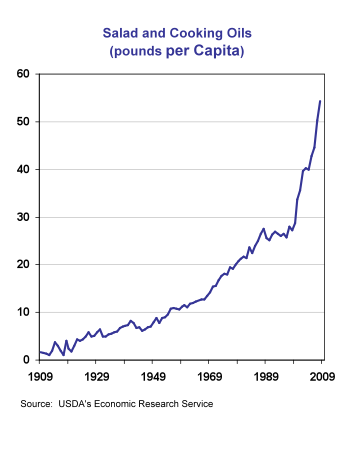 Chart 1: Per capita, we have almost tripled our consumption of fats in the last century, with all this increase attributable to refined vegetable oil (see Chart 2, below). 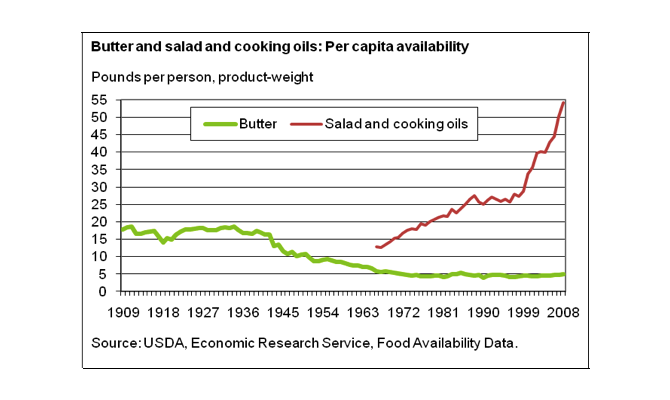 Chart 3: We eat less than a third of the butter consumed 100 years ago. Source: The Encyclopedia of Healing Foods, Michael Murray, 579.